Welcome to Stage 6 of The Great Cardsmith Designer Search (GCDS)...The Limited Archetype Challenge! This challenge is designed to test your ability to create support for a two-color Archetype in limited. Only the 3 Cardsmiths with the best overall submissions will move on. Your task is to design 5 cards that belong to a distinct two-color limited Archetype..
You must choose one of the ten two color combinations for your submission. Each player must choose a different color combo, so post in the thread below your choice. Colors will be disbursed on a first come, first serve basis. You may change your choice, but all colors must be finalized by Saturday, December 15th. 2) In addition to all evergreen mechanics, up to one non-evergreen mechanic may be used on a maximum of 3 cards. No named custom mechanics may be used. 1 monocolor card with a two-color color identity. 5) CARD TYPE: Artifacts, Enchantments, Creatures, Lands, Instants, and Sorceries are allowed. At least two card types must be represented in your submission. 7) All cards must be made on or after December 12, 2018. No old cards will be accepted. 8) Cards should be appropriate for printing in a generic standard legal set according to modern design principles. -Your Archetype should feel like either a new twist on an popular limited Archetype (U/R spells, W/U Fliers, R/W Aggro, etc.) or a new theme that plays in valid mechanical and flavor space for that color combo. -Avoid designing cards/themes that very closely resemble existing ones without a noticeable innovation or change. -Make your submission feel cohesive. I should be able to tell your Archetype theme from just looking at your cards alone with no background. -Ensure that your enablers viably enable your payoffs and that your payoffs are worth playing. -This does not necessarily mean you have to make extremely complex/nuanced designs. Rather, try to show me something fun, interesting, and creative within your Archetype that will play well and demonstrates your skills as a designer. -Does it innovate within the archetype? Do your enablers enable your payoffs? Are your payoffs worth building around? Can I distinguish your enablers from your payoffs? Do each of your cards promote your theme in some way. Do your cards use the mechanical resources of both colors inventively and effectively? Does the mechanical execution feel viable in a limited environment? Does the Archetype theme pioneer or innovate in new space? Is it appropriate for the color combo? 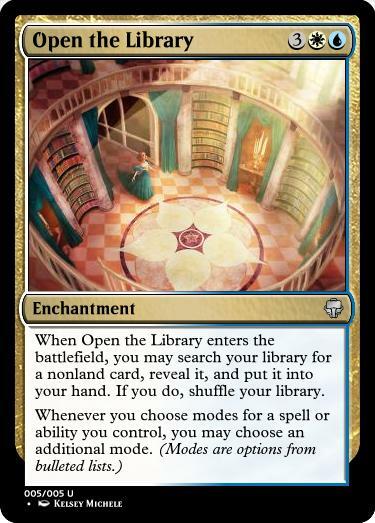 Is it distinct from other similar archetypes/themes within that color combo? Would your theme play well and be fun in limited? Does your theme come through loud and clear? The Top 3 scoring Cardmsmiths will advance to the next stage of the GCDS. The Cardsmith who is eliminated this round will receive 8 favorites of their choice. This contest will close for judging on Thursday, December 20th at 11:59 PM EST. No late entries will be accepted. Each Cardsmith will earn a total of 3 days “delay time” banked for the entirety of the GCDS. If you need more time for your submission, I will delay judging the amount of days you request. You can request 1 x 3 day extension, 3 x 1 - day extensions, or some other combo. In order to use your delay time, message me with the amount of days (1, 2, 3) you want BEFORE the juCardsmithsdging deadline. Your delay will only apply to your entries for that stage, not to the others. You may use 1 instance of delay time each stage. When a delay occurs, I will announce it. This stage is now open for business! Post your choices for your two-color combos below ASAP. Also, please request any favorites you may have earned from the last challenge. Just to make sure I understand the game, we can choose any "archetype", not just one that's currently in Standard? If I want to make an archetype that doesn't exist like "GR Noncreature spells matter" I can, correct? The Archetype theme doesn’t have to be supported in the current standard, just a generic standard set. For example, U/R artifacts isn’t viable in standard now but it would be fine for this challenge if you innovated on it. Or you can make an Archetype that has never been done in that color combo before (like G/R noncreature spells). Just make sure that if you choose to do the latter that your Archetype theme makes sense with the philosophies and mechanical limits of both colors. So the requirements include 3 enablers and 2 payoffs. Are we allowed to make cards that are both enablers and payoffs (Ulvenwald Mysteries, Drown in Filth)? If so, how do they count to those requirements? Yes you may do that. A single card can count for both categories. 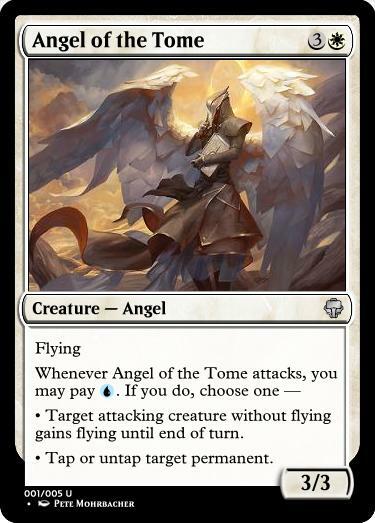 Another quick rules question on the challenge, if I make an archetype that cares about something, for instance "GW Goat Tribal (TM)", if I make a goat card, is it considered both a payoff (your other cards are pumping goats) and an enabler (your other cards care about you casting goats)? P.S: That's also an example, I do NOT want to do "GW Goat Tribal" either. In your example it would just be an enabler. I am amending the rules to make one restriction: your Archetype theme CANNOT be tribal. I intended on including this in the first place but didn’t realize until now that I had forgotten to write it out in the rules. Can I get a few suggestions on Rakdos archetypes? I've been following this although i can't compete and wondered what an archetype is. An archetype is a mechanical theme that is shared by a color combo . Examples. U/R Spells, W/G Tokens, B/R Madness. Sorry, I'm still struggling a bit with your definition of enablers and payoffs. I just have a couple more questions, just to clarify >.< So, if I care about a thing, let's say goats, then that thing is considered an enabler? If we follow that logic, things that boost goats would be payoffs then, right? So a Goat lord would be a payoff because it's the reason why you play goats in the first place and rewards you for playing Goats, but is also an enabler if it's a Goat itself? Alright, thanks for the clarifications! Note: I used MSE for the thumbnail because MTGCardsmith acts funny with modal spells (it doesn't recognize the em dash and the bullet), but the cards still exist on this website and you can click on them as usual to access the card page. To recreate the feeling of an actual standard archetype, I set myself some rules to differentiate what each colour could do (especially since there's no existing rules for this specific archetype). 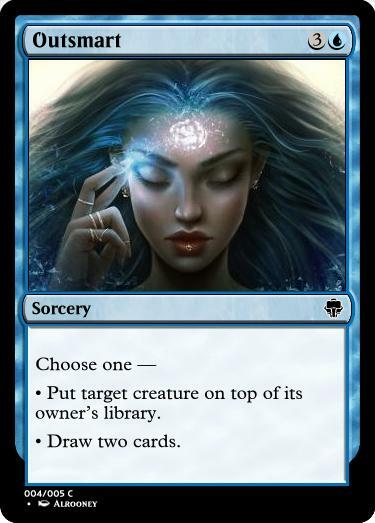 I decided that in my hypothetical standard that cares about choices, blue would have instant and sorceries modal spells while white would get the creatures. Both abilities are worth exactly four mana at instant speed, I traded the upsides of being on the same card with the downsides of being sorcery speed. Completing my demonstration from above: White gets the modal creatures while blue get the instants and sorceries. At this point, you should also notice I weaved the cards with the flavour or research and intellect. The modes represent an open mind full of knowledge. 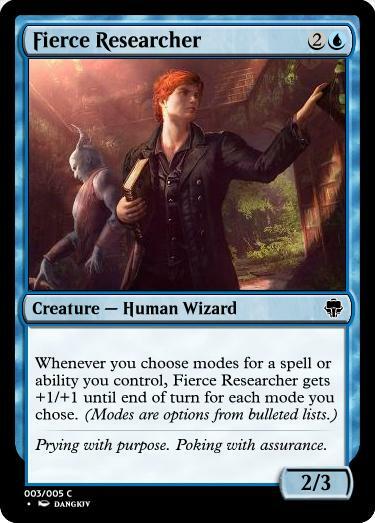 I couldn't do a modal matters archetype without a card that let you choose an additional mode for free. But it was more complicated than it looks because of the no-rare restriction. The first version of the card (which also let you choose the same mode more than once but didn't had the ETB ability and was only 3 mana) was screaming build-around me rare. I think I found the trick by adding that ETB ability that increased the cost but made it worth playing in limited as an uncommon. I really wanted one of my uncommon to be a repeatable choice to show the archetype was viable in limited. Funny story, it started as a blue sphinx before I decided the only creatures to get modal abilities should be white. I barely changed anything except exchanging the colours of the mana symbols, as this almost works in both monowhite and monoblue barring small subtleties like the untapping part. Oh good, I’d thought of a madness theme, but I was worried that it was too high on the storm scale. Thanks for mentioning it. Ok, sorry for butting in again, but what is the storm scale? I've heard of the ability storm but never learned what it does, so i guess that's another question. The storm scale is a number from 1-10 created by Mark Rosewater, Magic’s head Designer, that describes how likely a mechanic is to appear in a standard legal set in the future. 1 are evergreen mechanics like flying and haste and 10s are broken mechanics like dredge and storm. ok, similar to what he did for the worlds. I get it now. Thanks!